Not worth a dime. We use that phrase in reference to slackers or a product that does not measure up. 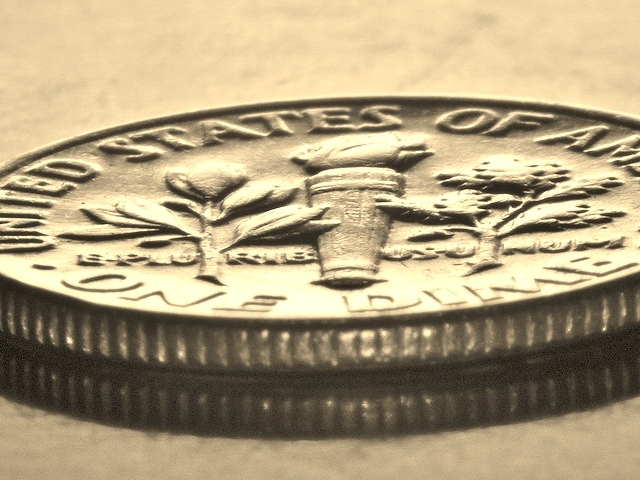 There is another phrase as well, “not worth a plug nickel”, which of course refers to a “slug” or fake coin the size of a nickel. And still another Southernism, “not worth the powder and lead to blow it/him up.” We generally use all three phrases for worthlessness. When I heard them say, “Jesus is not worth a dime”, I turned up the volume to get the context. Are you in effect saying to Jesus He is worthless with your giving of yourself, money, time and talents? One thin dime, 10 cents, $0.10 out of every dollar. Basically, they were saying if you had a dollar you would not give Jesus a dime of it … not worth a dime. People hoard their money, their time and their talents. Sometimes I wonder what we are saving up for … tomorrow is not ours, not even the rest of the day. For someone who grew up with tithing, I get it. I understand keeping 90% and giving back 10% of your money, time and talent. But, when you put it like that … when you realize that you basically are saying to Jesus, “you are not worth a dime” that really just overwhelms me. We do the same thing with our time and talent … 1 minute, 2 minutes (or NONE) spent in His word? Time spent in His house worshiping? Time given to help out others and the church? How much time did you spend on FB, online shopping … but, you never have the time for Him? I do believe tithing of your monies, time and talent is a generational thing. And although I do not have any studies to prove it, I would be more than willing to believe that givers beget givers. We learn from our parents and we pass on to our children our habits, practices, theologies. I think we really need to put more meat into our “passing on” and make sure we teach WHY and WHO we tithe our monies, time and talent. I went over how to teach your children about tithe in an earlier post, MONEY, MONEY, MONEY. It SHOULD NOT BE A ritual to practice or a good habit. There is a reason for tithing and giving of offerings (what we give above 10%). I remember my Mom and Dad always saying, “you cannot out-give God”. Tithe was the first check Mom wrote. They were involved in so many ministries at the church and in the community. I think we practically lived at the church. The joke was we were there every time the doors opened. It was understood that not giving back to God was treating Him shamefully. There are so many great stories of men and women who “get it”. I grew up hearing about such men and women of God. I think the most memorable one was R. G. LeTourneau. He gave 90 percent of his income to the Lord. He said, “I shovel out the money, and God shovels it back to me – but God has a bigger shovel.” (He invented earth-moving equipment). You? Your time? Money? Talents? Where are you cheating God? What are you passing on to your children? Is He worth One Thin Dime? Ten minutes of your hour? This entry was posted in COPYRIGHT:, Mom2Mom and tagged Christian parenting, God, Money, one thin dime, talents, time management, Tithe. Bookmark the permalink. Just right for this Sunday. Everyone who reads this today will understand the truth in what you are saying. Giving has been the most rewarding, it doesn’t even have to be a dime, just in your writing and blogging has kept me closer to God ! Thank you for sharing your wisdom !! !